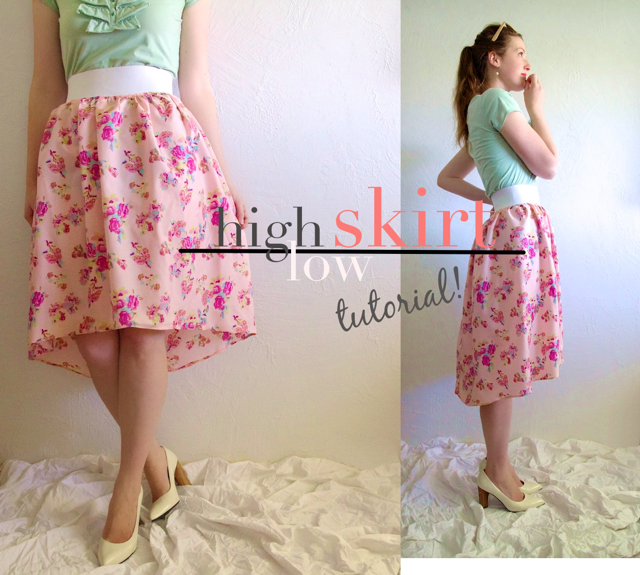 Subtle High-Low Skirt Tutorial-from Skirt or from Scratch! Hi! Good morning to you! So I've been trying to post this tutorial for simply. ages. But as most of us mommy bloggers understand, it sometimes takes a lot to get pictures of ourselves. I so envy those bloggers whose husbands are photographers! Even with a tripod and a timed shot setting it is really difficult. My house is really dark so it's tough to get a good photo in there and the "neighborhood" I live in is remarkably unphotogenic. Pair that with the fact that I watch two extra kids every day and the fact that I never have makeup on...and you see why Paige's perfectly dimpled face graces the blog a lot more than my own. :o) And then of course there is the whole "Ugh! My nose! Do my hips really look that wide?? Why is my hairline crooked?" and the list goes on. It's really easy! And you can make it from scratch, or skip the first 6 steps and make it from an existing skirt by simply altering the hemline. 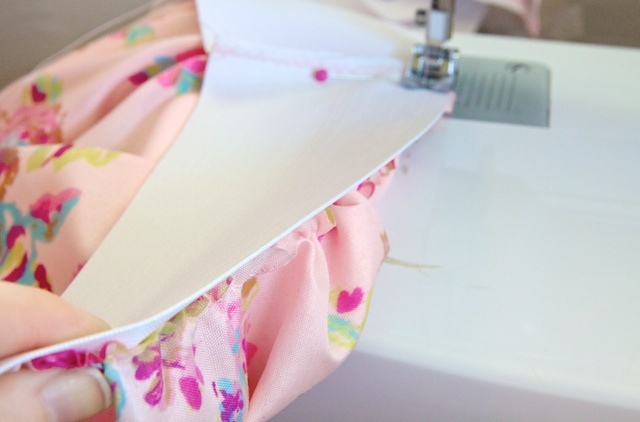 Sew along the edges to make one big tube-shaped piece. 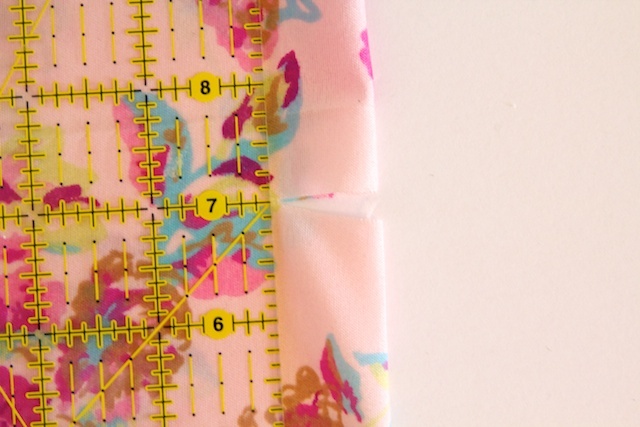 If you're using "super-frayish" fabric, like me, sew a zigzag stitch just to the right of your straight stitch. 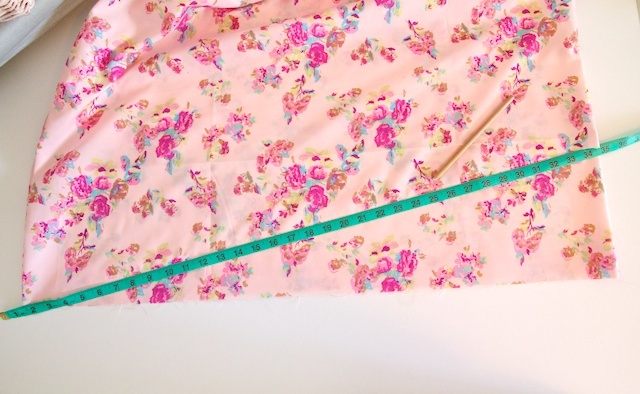 (Not Pictured) Sew a straight stitch on the longest stitch length along the top of the skirt, then pull the top thread gently to gather the top of the skirt piece to about half its size. 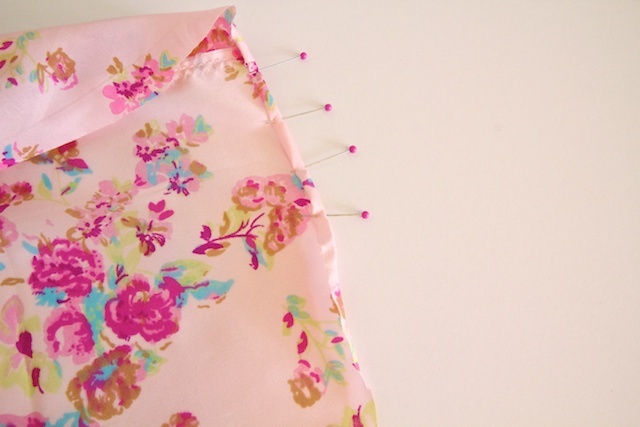 Pin elastic to the skirt in four (or more) equal places. 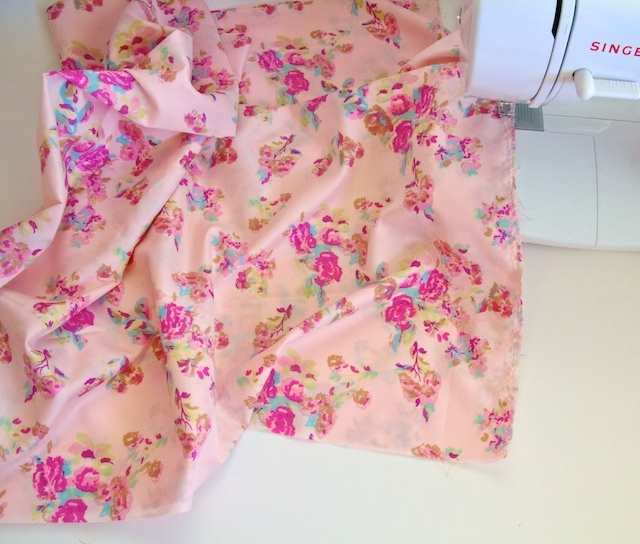 The elastic seam and skirt seam should match up, with right sides facing. Sew the elastic on along the top of the skirt piece, stretching it a little as you go to match the length of the skirt piece. 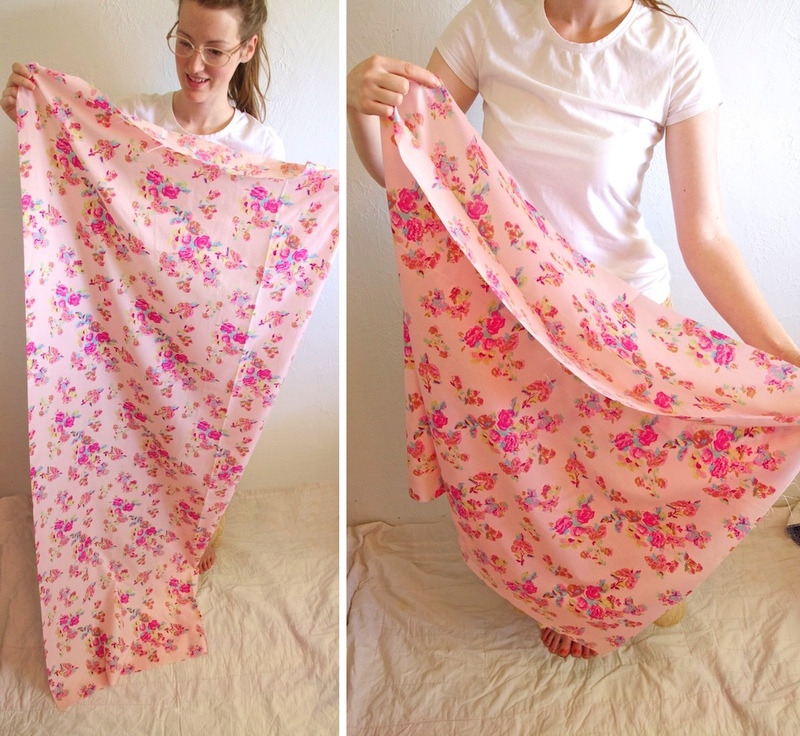 At this point you will have an unhemmed skirt! 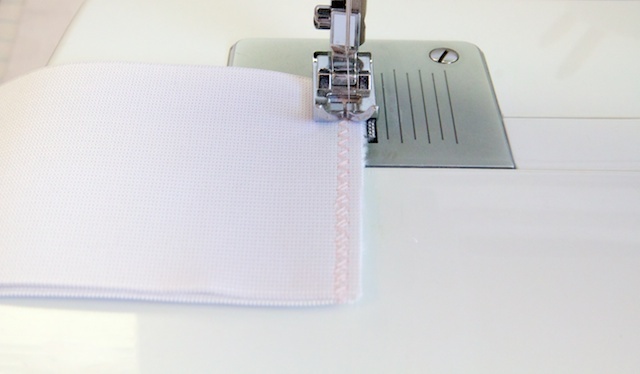 Fold under twice and sew to create a tiny hem. This is a little tricky as your skirt is cut in a slight curve now, but don't worry, just take your time and do your best! The lighter and more drape to your fabric, the better. This look is definitely better with a fabric that moves well and it's too stiff or heavy. And if you do prefer a more dramatic high-low skirt, you use the same technique, but with more of a "U" shape in your hemline. Here is little tutorial for that! What a great tutorial! 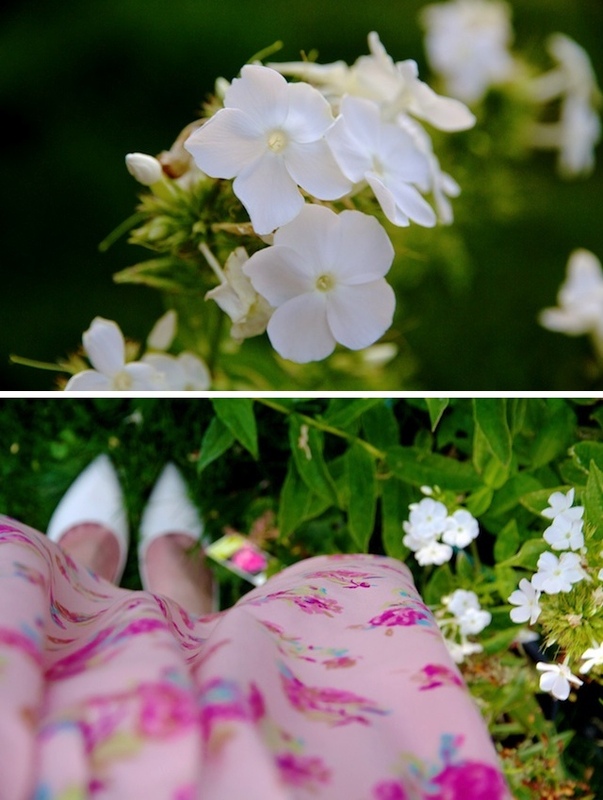 Such gorgeous photos - of you AND the skirt-making steps! I know just what you mean about wishing for someone else to take pictures (although for me it's usually when I'm demonstrating something that takes 2 hands). Blogging is harder than it loooooks! Love it! Turned out so cute....and the pics are lovely too :) I love the look of your hemline as I'm not for the really drastic ones either. Thx for sharing! I've always wondered how they got the right and left sides of the skirt to line up and match perfectly. Of course you would fold it in half and just draw a line for the front to be shorter than the back...it's genius yet so simple. I learned something cool today...thanks. I love this! I've been seeing skirts like this and love the look. Thanks, Disney! 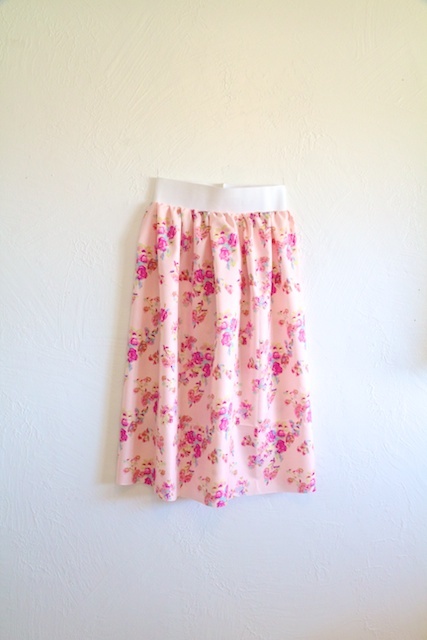 This is a really super cute skirt! 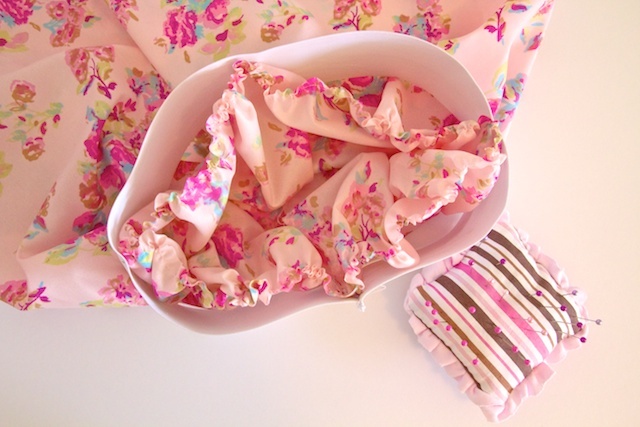 I absolutely love the feminine flirty fabric you picked, beautiful! Love it. I am going to do this! BTW, you are beautiful. I know we are always harder on ourselves. It does feel good to get dressed up and take pictures doestn't it? :) Thank you for the tutorial! And I understand so well not having a photogenic neighborhood and no photographer around (including myself! :S) Good to know I am not alone!! :O Your pictures turned out great anyway! I really like this look on you. It always makes a waist look pretty. Just so you know...you are rediculously pretty and photogenic and of course creative and talented (and I get the feeling that you're really nice too). I like that when I look at the photos on your blog I'm seeing what things look like on a real person who has to wear the stuff in real life...not on an airbrushed model who doesn't need to carry around a toddler and a baby everyday. So...lots of love to you. Well what a ridiculously nice comment! (...Mom??) :) I know what you mean about the models. I always think: "oh, I want those jeans!" but what I really mean is: "I want my legs to look like that in jeans!" It's so nice to see clothes on different sizes of people. As always... amazing, Disney! Thank you for the tutorial. Would you be willing to share where you got this fabric? How lovely! It came from Walmart, amazingly! I used to think they didn't have any cute fabric, but they've been getting a few cute prints in! Love the tip: making the slit in the front so it doesn't come to a peak. Thanx! PERFECT!! I too empathize with the self-pho issue. I somehow end up looking yellow in all of my indoor shots because the light is so bad. Buh. Anyways, the skirt is cute, and you are lovely! Totally unrelated question... What are the dress codes for church? I am going to a Christening soon and I haven't been to church since I was a kid, I dont want to offend anyone or turn up looking too formal. I love pics of you with your glasses on. You're too cute! Great tutorial. 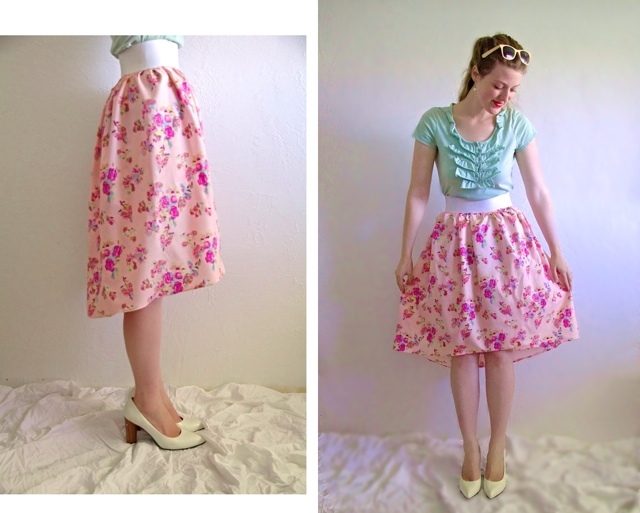 I have been hunting around for a tutorial for ages for this type of skirt. Right Where is the fabic !! You have just given me my Easter outfit! I'm going to make this and either the "Gardens at dusk" or "ruffly shirt refashion"...and maybe the lace necklace. Thank you! Hi, this is so wonderful and I am a beginner but I learned so quickly by just watching the tutorial, glad I found this cause it is exactly what I want. 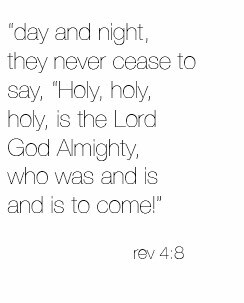 God bless and Thanks! Awesome and I love your dress sense! Thanks for sharing. 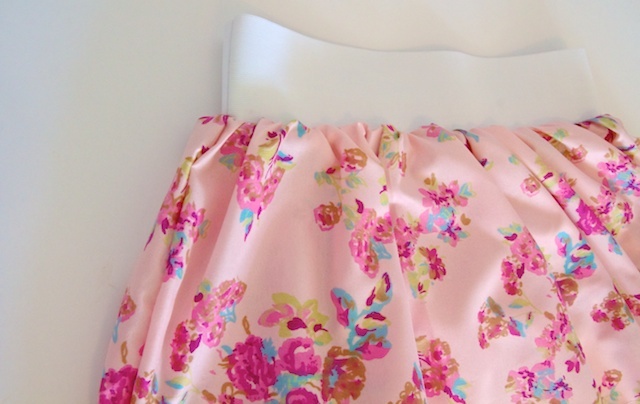 Lovely skirt, going to make a few of these . You look gorgeous by the way. Watch out UK, dippy hem style coming your way. Very generous of you to share. I make tulle skirts often, but I always cut the tulle into a circle skirt first then add the waist band. If i did it your way, will it be as flare as it is with a circle skirt? There would be less of a distinct flair using the method in this tutorial...I'd love to see this high-low look on a tulle circle skirt, that would be lovely!